Inspired by Penddu's great work in the previous post, I thought I'd try out a couple of experiments. As I said in the comments last time, I'd prefer to see slightly larger constituencies, averaging about six members each. In the Republic of Ireland, seats are between 3 and 5 members, which is fine for a country where there are "two-and-a-half" parties. But in Northern Ireland that wouldn't work so well because there are "four-and-a-half" parties, and the smaller ones would get squeezed out. Therefore they have six-member constituencies. Wales also has four main parties, with UKIP showing strongly in some elections ... and that's why I thought an average of six would be about right for Wales too. I was very impressed with Penddu's geographical split. I thought twice only about Ceredigion & Pembrokeshire and Torfaen & Monmouth ... the first because it was a bit long and the second because I wondered if Torfaen more naturally belonged to either the Gwent Valleys or Newport. But after thinking it through, what he had done was better than any alternative I could think of. 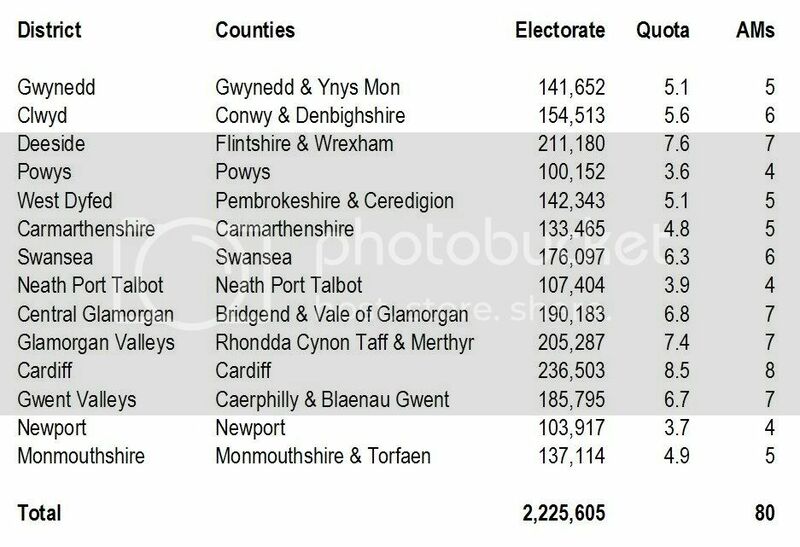 So, this is a table showing the number of seats for each of the 14 districts, but based on a Senedd with 80 seats. That's too many for now, but would be justified in not too many years' time ... when we have primary lawmaking powers, of course, and when the Justice system (police, courts and prisons/probation) is devolved to Wales. The 2015 election. The second thing I tried to work out was how these 80 seats would be distributed based on the votes cast in 2007. I don't know how Penddu did his calculation, but having tried it for myself it seems that roughly two-thirds of it is fairly straightforward, but the remaining third requires a lot of assumptions. It's a value judgement. There can be no precise answers because there are so many variables. I've also shown the percentages, and how they compare with the actual votes cast in 2007. I was quite pleasantly surprised by the degree of proportionality. If you want to see exactly how I worked it out, you can download the spreadsheet. It's rough and I haven't bothered to polish it up. The top half is my untouched version of the 2007 result, but below it I have taken the 2007 consituencies and grouped them into Penddu's 14 STV constituencies. This is a rough fit, but the numbers of votes only matter in relative terms, since the number of seats in each STV constituency has been worked out from the electoral roll data in the first table. Looking at the detail: The number of Conservative seats is a little high, but that is mainly due to my assumption that those who voted UKIP in 2007 would almost certainly vote Tory as a second choice. The UKIP vote wasn't high enough for them to gain any seats in their own right, but perhaps more people would have voted UKIP with STV. The number of Labour seats is a little high too, but it nearly always happens that the largest party gains a little from the smaller parties that don't get anything. This is great work and very interesting indeed. It shows quite clearly how STV could be implemented in Wales and would not impact enormously the pattern of competition amongst the parties i.e. in some areas Labour would benefit clearly. Sounds like the topic for a research seminar? MH - I did consider some alternative arrangements for Pembrokeshire & Ceredigion - placing South Pembrokeshire with Carmarthenshire - and placing Tofaen with Gwent Valleys and Monmouthshire with Newport, but my final arrangements do seem to work. One of the advantages of STV is it removes the temptation to gerrymander boundaries for part political advantage - the only real decision is whether to go for smaller or larger constituencies. And the danger(or benefit) of larger constituencies is that it improves the lihliehood of smaller parties getting elected. The writers appear to have formulated their conclusions without knowledge of the submission made in 2003 by the Parliament for Wales Campaign to the Richard Commission – which came to essentially identical conclusions. It is reasonable to infer that these independent analyses, having come to such similar conclusions, are robust and do hold out the prospect of genuine proportionality for STV in an 80-seat Senedd. Thanks for the links to PfW, Anon. I thought it was worth highlightling them in a new post.